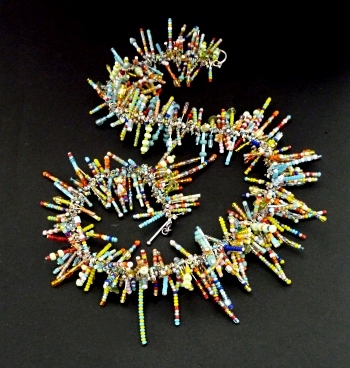 This tactile, spiky, colourful necklace is probably the most commented on piece I've made! Made with a mix of beads threaded onto 1,000 headpins and then a turned loop made on each one. The headpins are then strung to finish the necklace. This necklace was featured as a project in the Summer 2006 issue of Step-By-Step Wire Magazine.